We could all take a hint from Steve Wozniak’s career advice. I walked up to Mandarin Gourmet, a restaurant two blocks from Apple headquarters. The location couldn’t have been more perfect, because in just a few minutes, I would be interviewing Steve Wozniak, the cofounder of Apple, who built one of the first personal computers with his bare hands. I was standing in front of the entrance when my phone rang. It was my friend Ryan. Before I could respond, out of the corner of my eye I saw Steve Wozniak striding toward me, wearing sneakers and sunglasses. A pen and green laser pointer were clipped to the chest pocket of his shirt. I hung up my phone and greeted him, and then stepped inside. As soon as we sat, I picked up a menu but Wozniak motioned for me to put it down. He called over the waiter and ordered for both of us with the enthusiasm of a kid who could get all the desserts he wanted. Our table was soon overflowing with fried rice, vegetable chow mein, Chinese chicken salad, sesame chicken, honey walnut prawns, Mongolian beef, and crispy egg rolls. Even before our first bite, Wozniak already seemed to be the happiest person I’d ever met. Whether he was telling me about his wife, his dogs, his favorite restaurants, or the road trip he was about to take to Lake Tahoe, Wozniak seemed to love everything about his life. He told me that he met Steve Jobs in 1971, just a few miles from where we were sitting. Jobs was in high school and Wozniak was in college. The moment they met, Wozniak and Jobs hit it off and spent hours sitting on a sidewalk, laughing and sharing stories about pranks they’d pulled. As Wozniak told me prank after prank, a woman with short brown hair joined our table. Wozniak introduced his wife, Janet. He unclipped the green laser pointer from his shirt and held it close to my face, telling me it could detect “how much brains” I had. When he shined it into my right ear, green light appeared on the opposite wall. Glancing down, I spotted a second laser pointer he was holding under the table. Woz and I let out a laugh. He clipped his laser pointer back on his shirt and told his wife about my mission. He shared with her the names of the people I was interviewing. His words trailed as though he was baiting me for a response. It felt like he was testing me, but I didn’t know what to say, so I did the only thing I could think of—I stuffed an egg roll in my mouth. “Is that why you’re so happy?” I asked. I was curious about the difference between Wozniak and Steve Jobs, so I asked what it was like founding Apple when it was just the two of them. Wozniak shared a handful of stories, but what stood out most were the ones that made it clear how different their values were. One story took place before Apple was formed. Jobs was working at Atari and was assigned to create a video game. He knew Wozniak was a better engineer, so he made a deal: if Wozniak would create the game, they would split the seven-hundred-dollar pay. Wozniak was grateful for the opportunity and built the game. As soon as Jobs got paid, he gave his friend the three hundred and fifty dollars he had promised. Ten years later, Wozniak learned that Jobs hadn’t been paid seven hundred dollars for the game, but rather thousands of dollars. When the story broke in the news, Steve Jobs denied it, but even the CEO of Atari claimed it was true. Another story took place early in Apple’s growth. At the time, it seemed obvious Jobs would be the company’s CEO, but it wasn’t clear where Wozniak would fit in on the executive team. Jobs asked him what position he wanted. Wozniak knew that managing people and dealing with corporate politics were the last things he wanted to do. So he told Jobs he wanted his position capped at engineer. The final story Wozniak shared took place around the time Apple filed for its initial public offering. Jobs and Wozniak were set to make more money than they ever imagined. Leading up to the public offering, Wozniak found out that Jobs had refused stock options to some of Apple’s earliest employees. To Wozniak, these people were family. They helped build the company. But Jobs refused to budge. So Wozniak took it upon himself and gifted some of his own shares to the early employees, so they all could share in the financial rewards. On the day the company went public, those early employees became millionaires. As I watched Wozniak lean back in his chair, cracking open a fortune cookie and laughing with his wife, I could hear the words my friend Ryan had told me before the interview ringing in my ears. But the only thing that came to mind was: Who’s to say that Steve Jobs was more successful? This is just a glimpse of the lessons Alex learns on his journey. To read what happens next in his interviews with Pitbull, Jane Goodall, Jessica Alba, Quincy Jones, and how it all leads to a fateful week with Lady Gaga, check out Alex’s new book The Third Door: The Wild Quest to Uncover How the World’s Most Successful People Launched Their Career. It’s out now and filled with even more wild stories and practical lessons to empower your journey. And, hopefully, you won’t have to stuff an egg roll in your mouth to get the answers. 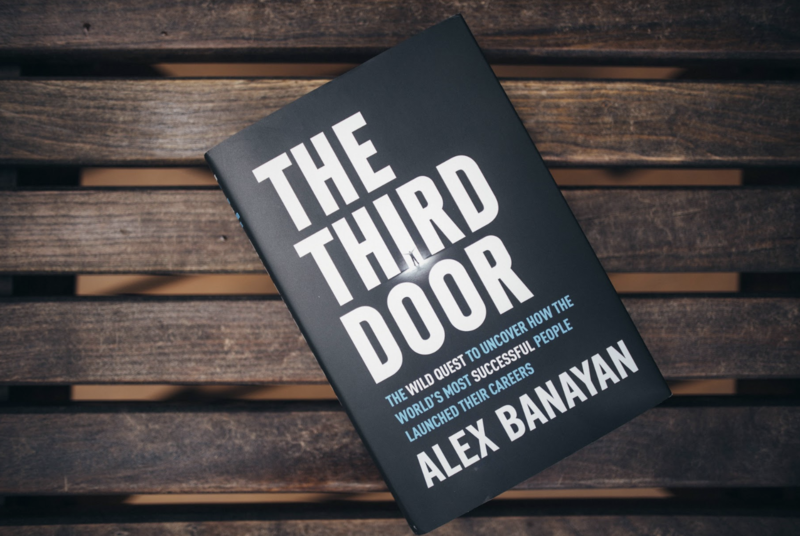 Alex Banayan is the author of the new book The Third Door: The Wild Quest to Uncover How the World’s Most Successful People Launched Their Careers, which is available everywhere June 5th.